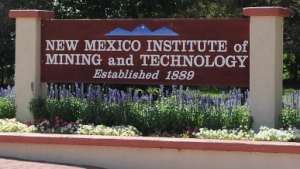 New Mexico Institute of Mining and Technology (AKA New Mexico Tech) was founded in 1889 and almost every member of its faculty have doctoral degrees. Additionally, the university is well known as a research-based university with more than a dozen different research divisions that work with government institutions, leading industry organizations, as well as collaboratively with other universities in similar fields. The Department of Petroleum & Natural Gas Engineering offers Bachelors, Masters and Doctoral degrees in the field and offers a number of privately funded scholarship opportunities for both undergraduate and graduate students. Additionally, the petroleum engineering programs is currently ranked in the top 10 in the country for research in the field. This is in no small part to the dedicated petroleum engineering research divisions such as the Petroleum Research and Recovery Center, and the New Mexico Bureau of Mines & Mineral Resources. This gives students opportunities to work on cutting edge research for improved oil & gas recovery, exploration and processing techniques. Thanks to these programs, New Mexico Institute of Mining and Technology helps ensure that their petroleum engineer graduates are well-prepared for a career in the industry. Another interesting thing to note is that the undergraduate engineering students are required to finish their degrees with a “Capstone” project assigned by a senior faculty to help them apply their expertise and knowledge in challenging ways to prepare them for future careers in technology, science and engineering.